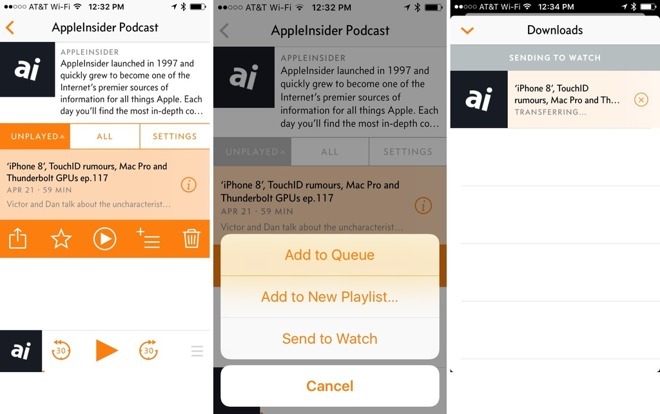 Popular iOS podcast app Overcast has updated with the ability to sync episodes directly to an Apple Watch, letting runners and others leave home without an iPhone in tow. The option can be invoked by tapping the Queue menu in the iPhone app's episode controls and selecting "Send to Watch." Transfers will appear in the app's Downloads screen. Before copying the iPhone app transcodes to a smaller filesize, incorporating any speed settings at the same time. Position, recommendations, and deletions should all sync between devices. Until now the Apple Watch has had little support for local podcast playback. Even Apple's official Podcasts app, last updated in Sept. 2016, doesn't support sync. As a workaround, one option involves manually adding podcast files to a synced Music playlist. The Watch has relatively little storage space, which could impose limits on how many podcasts can be copied. Apple's native Music sync functions limit owners to 2 gigabytes or 250 songs. Unlike Music, Overcast can sync files without a Watch being connected to power, but there's also no auto-sync function. Overcast is a free download, and requires a device running iOS 10.2 or later. To go ad-free and unlock full features, however, people must pay $9.99 per year for a Premium subscription.